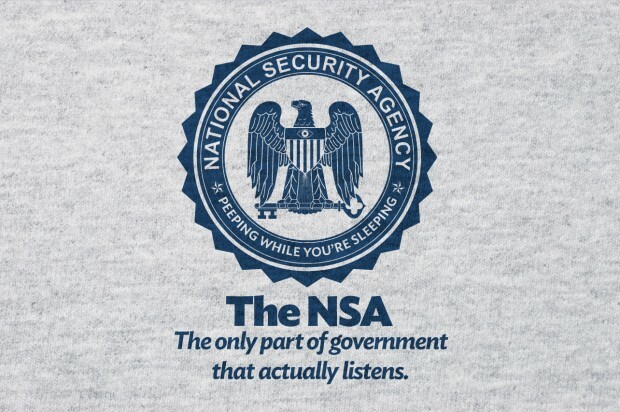 That this T-shirt was not approved, endorsed, or authorized by the NSA could not possibly be any clearer, so the NSA's efforts to censor this T-shirt constitute bald-faced intimidation in an effort to muzzle political dissent. A clearer violation of the First Amendment is hard to imagine. Not that this should come as a surprise to anyone who has been paying attention, but it turns out that CNN takes money from the government in exchange for editorial control of content. Glenn Greenwald's partner was detained by British authorities for nine hours today. [A]ny journalist passing through London’s Heathrow has now been warned: do not take any documents with you. Britain is now a police state when it comes to journalists, just like Russia is. They obviously had zero suspicion that David was associated with a terrorist organization or involved in any terrorist plot. Instead, they spent their time interrogating him about the NSA reporting which Laura Poitras, the Guardian and I are doing, as well the content of the electronic products he was carrying. They completely abused their own terrorism law for reasons having nothing whatsoever to do with terrorism: a potent reminder of how often governments lie when they claim that they need powers to stop "the terrorists", and how dangerous it is to vest unchecked power with political officials in its name. This is obviously a rather profound escalation of their attacks on the news-gathering process and journalism. It's bad enough to prosecute and imprison sources. It's worse still to imprison journalists who report the truth. But to start detaining the family members and loved ones of journalists is simply despotic. Even the Mafia had ethical rules against targeting the family members of people they feel threatened by. But the UK puppets and their owners in the US national security state obviously are unconstrained by even those minimal scruples. If the UK and US governments believe that tactics like this are going to deter or intimidate us in any way from continuing to report aggressively on what these documents reveal, they are beyond deluded. If anything, it will have only the opposite effect: to embolden us even further. Or, of course, you can go straight to the source (so to speak). Thank God for Glenn Greenwald. If the dream of freedom dies in my lifetime (and I very much fear that it might) it won't be for want of Glenn's efforts. There was another high-profile jet crash last week, a UPS cargo plane this time, flown by American (or at least non-Korean) pilots. Details are very sketchy (no civilian casualties means light news coverage in today's world) but superficially the crash looks an awful lot like Asiana 214. Both planes crashed short of the runway with (apparently) no mechanical problems. Both times pilots received warnings of impending doom seconds before the crash. ... a combination of weather (low clouds and raining), time of day (before dawn), and a tricky visual approach [emphasis added] over hills to the airport’s shorter runway because the much longer, more familiar runway – the one that provided glide slope as well as direction information to approaching pilots – was closed for maintenance. A visual approach by definition is one where you can see the runway. If there were low clouds and rain then the pilots were not doing a visual approach. National Transportation Safety Board member Robert Sumwalt ... said the aircraft went down during its first landing attempt. Sumwalt said investigators have not found any problems with the runway's lights or navigation system, which typically provides pilots with information about their lateral position but not about their altitude, unlike those on runways where pilots can land using only instruments [emphasis added]. This reporter is confused in so many ways it's hard to know where to begin to deconstruct this. What the reporter (almost certainly) meant to say was that the UPS plane was landing on a runway that only had a so-called non-precision instrument approach procedure, which provides no vertical guidance. But not having vertical guidance provided as part of the approach procedure is not even remotely the same thing as not having information about the plane's altitude. Pilots always know their altitude, at least if they're doing their job right. The difference is that in a non-precision approach the pilot has to manually cross-reference the plane's location against the chart to figure out at what altitude the plane should be, whereas in a precision approach there's a little needle on the panel constantly telling you whether you are too high or too low. No matter what kind of approach you are flying, at some point you must be able to see the runway in order to land (with one very rare exception called a Category III ILS, which was not available at Birmingham on any runway). The difference between a precision and non-precision approach is not that one lets you land using only instruments, but simply that a precision approach lets you descend lower before you have to either be able to see the runway or abort the approach. Non-precision approaches are harder to fly. On a precision approach you just "fly the needle" (or have the autopilot do it for you). On a non-precision approach you must constantly cross-reference your position against a chart, and manually control the plane's altitude so that it is close to -- but never lower than -- the minimum altitude allowed for the particular segment of the approach you are flying. It is one of the most challenging operations a pilot is ever called on to perform, and it is what the pilots of the UPS plane were doing when they crashed. The approach to runway 18 at BHM is particularly tricky because the approach procedure has unusually low margins for error. The last waypoint on the approach has a minimum altitude of 1380 feet. The runway altitude is 650 feet. Between the final waypoint and the runway there is a hill that is 915 feet high. The minimum descent altitude before you must be able to see the runway is 1200 feet, less than 300 feet above the hill. The official weather report said there were "few" (which is FAA-speak for scattered) clouds at 1100 feet. And it was dark. The "normal" margin of error in maintaining altitude when flying under instruments is 200 feet. Deviating by more than that is considered a serious mistake, but it is actually not that uncommon, especially among pilots who don't fly very often (ahem). That was obviously not the case here, but the point is that even under normal circumstances any pilot who flies this approach is one mistake away from death. That is unusual. Normally you have to make two or three pretty serious mistakes in a row to actually kill yourself in an airplane. Not here. So this accident, like Asiana 214, looks like it was very likely pilot error. But I would say the two situations are not comparable. Asiana was pilot error under ideal circumstances, a situation that any pilot should have been able to handle with ease. The UPS crash was pilot error under some of the most demanding circumstances possible short of an actual emergency. No less tragic, and no less of an error, but not nearly as indicative of a systemic failure as Asiana 214. I learned with dismay that the Obama administration is actually on firmer legal ground than I imagined in its en-masse acquisition of phone metadata. The government precedent is Smith v. Maryland (1979) where the Supreme Court specifically held that the warrantless installation of a pen register (a device that records what numbers are dialed on a phone line) did not violate the fourth amendment because there is no "legitimate expectation of privacy" on the numbers you dial. The court might be forgiven for making this mistake in 1979. But in 2013 it should be obvious to everyone that this analysis is wrong. Just because there is no sound doesn't mean there is no communication. Communication just means the transmission of information from a sender to a recipient. Whether that information is analog or digital, or whether it has anything at all to do with someone's voice, is immaterial. When I dial my phone there is no question that I am sending information to -- and hence communicating with -- the phone company. Now, it is still an open question whether this particular communication is subject to a reasonable expectation of privacy. Not all communications are. For example, if you have an old-school conversation with another human being in a public place you have no reasonable expectation of privacy because you could be overheard by anyone. So do you have a reasonable expectation of privacy when communicating with the phone company? I for one certainly thought so until I read Smith v. Maryland. There is all kinds of information that I transmit to companies I do business with that I expect them to keep private. Surely the founding fathers considered business records to be part of one's "papers and effects" regardless of whether or not they were actually kept on paper. But leave aside the question of whether we have a constitutional right to privacy in our business dealings and ask a more fundamental question: are we even allowed to offer privacy as a contractual obligation in the U.S. any more? Clearly if my contract with the phone company had included a clause that stipulated that they promised not to turn over my records to the government without a warrant then I would have a clear-cut reasonable expectation of privacy (because I have a reasonable expectation that the people I'm doing business with will honor their contractual obligations). But is this even possible nowadays? Sadly, the experiment has been done, and the answer seems to be "no". I say "seems to be" because we don't actually know what transpired to make Lavabit shut down. But it seems pretty clear that Ladar Levison didn't pull the plug because he got tired of running the company. Which brings me full circle to my central complaint, which is not about surveillance, but rather about secrecy and the end-runs that are being done around the Constitution and the rule of law in the name of security. Underlying the rule of law are some unwritten meta-rules, one of which is that you can't reasonably expect people to play by the rules if it is not possible for them to know what the rules are. And right now it is not possible, thanks to a combination of shady deals conducted behind closed doors and a supreme court that is ignorant of technology and playing fast and loose with the meanings of English words like "communication." Aliens knowledge. Same fundamental physical constants, but they may, unlike us, have worked out why they have the values they do. In retrospect it is obvious that the antecedent for "they" is "fundamental physical constants." But that's not how I read it. I read it with "Aliens" as the antecedent, and hence a different meaning for the word "values." Why did I read it this way? Because I actually met Richard Dawkins last December on a cruise to Antarctica and had the opportunity to have some extended discussions with him, so I happened to know that he actually *is* puzzled over why humans have the values they have. Specifically, he is puzzled over how anyone could be religious in general, and Muslim in particular, which he believes has a lot more of (choose your favorite term for whatever it is about religions that makes them bad) than other religions do. So I thought that was the sentiment he was expressing. It was a sentiment I have always found puzzling because I believe that we humans (well, some humans) do understand why we humans have the values (in the sociological sense) that we have, and that this understanding comes in no small measure from Dawkins's own work. When we discussed it on the cruise I never really got a satisfactory (to me) answer out of him so I decided to ask him about it again. What was interesting and remarkable about Jesus was not the obvious fact that he believed in the God of his Jewish religion, but that he rebelled against many aspects of Yahweh's vengeful nastiness. At least in the teachings that are attributed to him, he publicly advocated niceness and was one of the first to do so. [However, f]rom a rational choice point of view, or from a Darwinian point of view, human super niceness is just plain dumb. And yes, it is the kind of dumb that should be encouraged - which is the purpose of my article. Human super niceness is a perversion of Darwinism because, in a wild population, it would be removed by natural selection. How does he know this? He doesn't say. He just takes it as a self-evident fact. And it certainly does seem intuitively plausible that super-niceness is not an evolutionarily stable strategy. But if there's one thing that the study of evolutionary biology teaches us it is that intuition is not always an effective guide. Peacock's tails, for example, would seem intuitively like something evolution ought to have weeded out long ago. They serve no apparent practical purpose. They cost energy. They make the peacock less maneuverable and hence more vulnerable to predators. So why do they exist? The answer is not, as I first assumed, that peacocks have no predators. They do. So why do peacocks have those ridiculous tails? It's because they do serve a practical purpose, though not one that is immediately apparent (at least it wasn't to me). They use their tails to intimidate their predators. So whatever evolutionary disadvantage a large tail produces in terms of avoiding predators, it is (apparently, given that there are still peacocks) more than offset by the advantage they provide in scaring predators away. But notice that this advantage depends crucially on two factors. First, it depends on the peacock's environment. Specifically, it depends on the peacock's predators all being dumb enough to be fooled by the ruse. As soon as a predator evolves that is smart enough to see through the peacock's ruse and attack him despite the fact that his flared tail looks big and scary, the peacock is done for. And second, it depends on the peacock in some sense believing in the ruse. Not that I think peacocks are really capable of thinking these things through, but somewhere in their brains there must be a computational process that goes something like, "If I flare my tail, I am in fact no bigger and scarier than I was before. But if I act as if I am bigger and scarier, then my predator might believe that I am bigger and scarier, and the net effect will be the same. Therefore I will act as if I am bigger and scarier despite the fact that I am not." Belief becomes reified. The prophecy is self-fulfilling, and the peacock lives. Now, suppose some human gets it into his head by some random memetic mutation that it might be a good idea to be nice. Again, intuitively, such an idea could never survive "in the wild", that is, in an environment full of predators and other non-nice things. But suppose this mutation arises in an environment where the number of predators have already been reduced for some other reason. Suppose this person lives in a world where civilization has been invented in order to support an agricultural rather than a hunter-gatherer lifestyle. Cities have been invented, along with the rule of law. In such an environment, niceness might get an evolutionary toehold and not immediately be snuffed out. If the niceness meme manages to get established at all, an amazing positive feedback effect can start to occur: niceness can provide a reproductive advantage in an environment that contains other nice entities. A group of nice people can have a reproductive advantage over a group of non-nice people because the nice people will spend less of their resources on (say) building weapons and defenses and more on producing food and acquiring knowledge, which can be leveraged into other reproductive advantages. This works as long as the nice population can remain relatively isolated from the non-nice population. As soon as the non-nice people meet the nice ones, the nice ones lose, at least in the short term. But in the long term, two things happen: first, the prisoner's dilemma is iterated, and in an iterated prisoner's dilemma cooperation wins. And second, the nice genes and memes will evolve the ability to recognize other carriers of the nice genes and memes. They will do so, obviously, because this ability also confers a reproductive advantage. The most advantageous position in the evolutionary game is to be a member of the largest group of mutually cooperating entities that you can gain entry into. Notice that "rationality" has almost nothing to do with this process. If you can reliably identify other members of your mutually cooperating group by seeing them pray five times a day, then that is what will evolve. There is one advantage that rationality offers in terms of reproductive fitness, and that is that it can help you manipulate your environment to your advantage. If you want to be free from disease, say, antibiotics really do work better than prayer (at least for a while). But there are two things that mitigate against the widespread proliferation of rationality in the long run. First, you don't have to be rational yourself in order to benefit from the products of rationality. Antibiotics work as well on fundamentalists as they do on scientists. And second, rationality leads people to voluntarily limit their own fertility (this is just an empirical fact -- I do not mean to imply by this that having children is irrational). So the long term Darwinian fate of rationality is far from clear. But the long-term Darwinian fate of niceness, and even super-niceness, is much clearer. For starters, there are actual examples in nature of super-niceness. Ants, for example, are super-nice to other ants within their own colony. Intra-colony niceness among ants is so extreme that it is actually a mistake to think of ants as individual living entities. It is the ant colony that is the self-reproducing entity, with individual ants being more akin to cells or organs in our own bodies. Indeed, our own bodies are colonies of what were once single-celled creatures who figured out that by banding together they would do better than they could on their own. (Occasionally, one of these entities defects. The result is cancer.) There is no room for doubt: from an evolutionary point of view, in the long run, niceness wins. On this view, the rise of the surveillance state is a natural evolutionary step. If our long-term evolutionary destinty is to become a colony of super-nice individuals, then defectors (in the game-theoretic sense) will have to be weeded out, and in order to be weeded out they will have to be found. What better way to find them than to build an Orwellian world. In fairness, since I harshed on Korean pilots, I should note for the record that early indications are that the landing gear failure on Southwest flight 347 was also the result of a botched landing. The details are still fuzzy, but it sure looks to me based on what has been publicly announced that the captain should have (and could have) initiated a go-around. And as long as I'm judging my fellow pilots I should probably give myself a little public flogging: yesterday I went flying after dark to get night current again and my landing light failed. A landing light isn't actually required (unless you're carrying passengers for hire), but for safety's sake I probably should have gone back and landed on the longer and better-lit runway at San Jose rather than attempt a night landing without a light at the much shorter and darker runway of my home base at Palo Alto. But I didn't, and I bounced the landing. I probably should have gone around too, but I didn't. No harm done, but it could have been worse. The runway at PAO is only 2000 feet long so there's not a lot of margin for error there. So what on earth could Dawkins have possibly meant by this? I predict that before this is all over (if it is ever over) it will be revealed that someone at the NSA used wiretap information to strongarm (which is a polite term for blackmail) some key legislators into voting against defunding the NSA. As Hal Holbruck said, if you want the truth, follow the money. [T]wo months ago, I contacted some colleagues at NSA. We had a little meeting, and the question came up, was NSA collecting everything now? Because we kind of figured that was the goal all along. And the answer came back. It was, yes, they are collecting everything, contents word for word, everything of every domestic communication in this country. Um, maybe there's something wrong with the protocols then? Florida’s Escambia County Sheriff David Morgan sees nothing wrong with the fact that officers in his patrol fired 15 shots at an unarmed, 60-year-old black man. The sheriff told CNN that his officers were, in fact, following protocol perfectly. I wonder, does it ever even enter their heads that maybe, if the outcome is the regular shooting of unarmed civilians, that maybe the protocols need changing? Oh, right, silly me, of course not. All the dead people are black, so it's no problem.